A pilot scheme will be rolled out across Blanchardstown and Castleknock. A STATIONLESS PUBLIC bike-sharing scheme is to be rolled out in Dublin 15. The pilot scheme will use dock-less bikes, unlike DublinBikes, which must be docked at specified locations. The announcement was made at the Fingal Transportation Strategic Policy Committee earlier this week. “The general idea behind the system is that the bikes are self-locking. There is a physical lock on the bike that prevents it from being used which means that the bike does not need to be locked to something. Users download a mobile app on their smartphone which unlocks the bike when they want to use it, charging a fee. 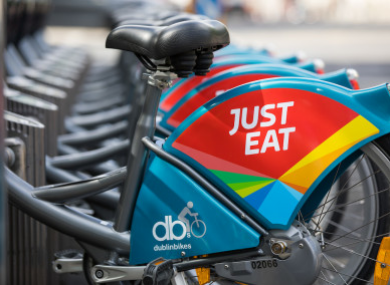 “The main benefit of these schemes is that bike sharing can be introduced at little or no cost to Fingal outside of the areas currently served by Dublin bikes. A pilot scheme will be rolled out across Blanchardstown and Castleknock, an announcement welcomed by local Green Party councillor Roderic O’Gorman. “While the Dublin Bikes scheme in Dublin City requires users to pick up and drop off bikes at a specific docking station, the plan for Dublin 15 is to use a system where bikes are picked up and dropped off within specific areas. The bikes will be self-locking, which means they cannot be taken by anyone who is not a member of the sharing system. This system will not require the expensive infrastructure of a docking station, which makes it much more flexible. “Fingal plan to pick a number of locations in Dublin 15 to use as pick-up/drop-off points. I look forward to working with the Council to identifying suitable locations, with a strong focus on public transport hubs like train stations, the Blanchardstown Town Centres, and our villages. Email “A dockless public bike scheme is coming to Blanchardstown”. Feedback on “A dockless public bike scheme is coming to Blanchardstown”.